This baby kale salad is for all the kale haters out there. I know you read this website even though I keep trying to sell you kale. Why do I do it? Have you check out the nutritional information on kale? Two cups of baby kale contains 3 grams of fiber, and 15% of the daily requirement of calcium and vitamin B6 (pyridoxine), 10% of magnesium, 170% of vitamin A, 170% of vitamin C, and 750% of vitamin K.
How can you go wrong? Usually, I try to sell you regular grown-up kale see: raw kale caesar salad and best kale salad. Today, we will talk about baby kale. It is not wearing diapers (in case you were wondering). 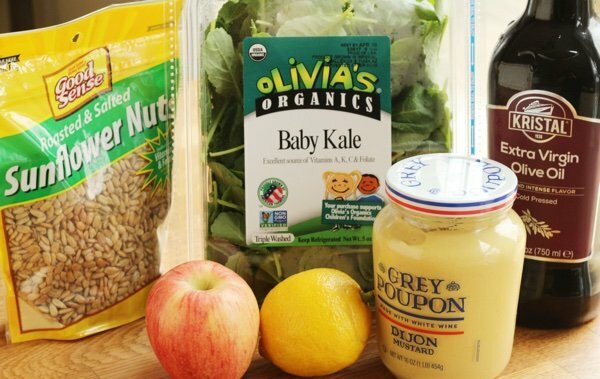 What is baby kale? Simply put, it is kale that is picked before it grows into the huge leaf that you must strip off the stem before you eat. 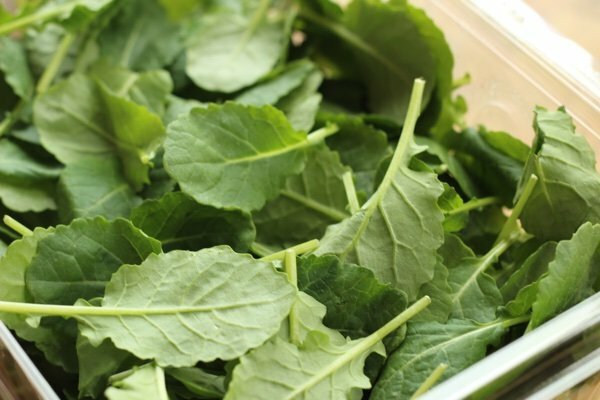 It is a great kale alternative for those who find regular kale too tough to eat. You see how nice and leafy this looks? I found it next to the lettuce, arugula, and spinach. It is pre-washed so it is SO EASY. You really have no excuses not to try it. It does taste like kale, but I find the flavor a bit mellower than the adult version and it is much easier to chew. 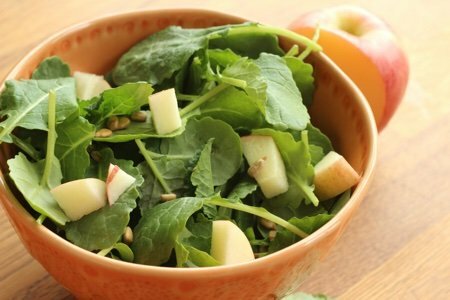 This salad includes an apple as a contrast to the more bitter kale. This is a mostly savory salad with a little bit of sweet crunch. I included sunflower seeds to bring up the nutritional value even more. Any time you add a seed - you are adding a punch of nutrients that your body will love. They also make your salad much more interesting and all you have to do is toss them on there. Have you tried baby kale? What did you think of it? 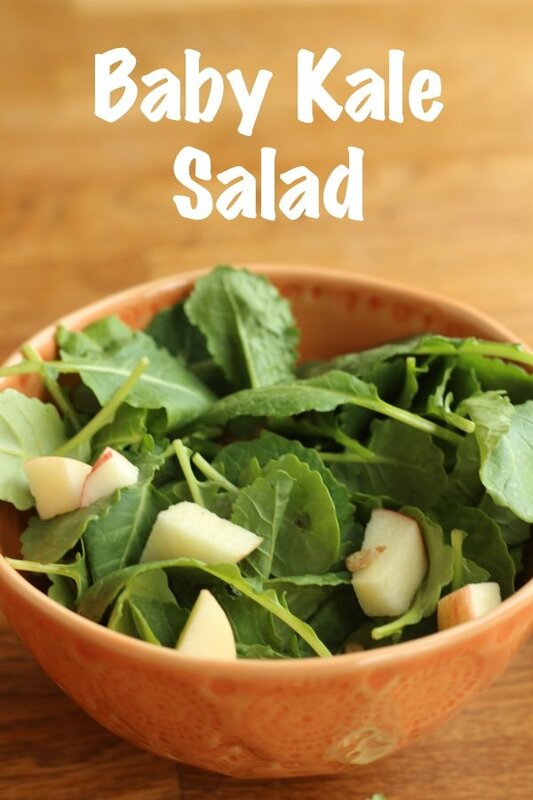 Put kale and apples in a large bowl. Mix olive oil, mustard, vinegar, and salt and pepper in a small bowl. Pour dressing on salad and toss. Add sunflower seeds and serve immediately. I like the sound of these flavors and textures alot! At present I'm working on oil-free dressings [not fat-free tho] and I've been liking homemade hummus this week. I throw into the blender with chickpeas, an oven-roasted red pepper and about 8-9 kalamata olives, 1 garlic clove and lemon juice. I think it would go great on your kale-apple salad. I'll serve this tonight. Thanks Lisa! Baby kale! I’m in. Always looking for more interesting, nourishing salad materials. Love Snack Girl. Thank you! I have tried baby kale and I love it! I saw it at Trader Joes and grabbed it...I am not one to be massaging my food before I eat it. I will cook, prep, etc, but just cannot bring myself to do the extra step/steps for regular kale. This is the way to go!!! I use kale often but I think it was Dr. Oz that warned to switch between kale and other leafy greens because too much Vit.A can be a danger to the liver. This looks great and so simple . . . but where are the carbs coming from - the apple? @Lynn - Yes, the carbs are coming from the apple. Thanks for your question!